You can make an online reservation via the website or by phone. We do not accept orders via email or Whats-App. We recommend making an order up to one day in advance. Cakes should be ordered at least two days in advance. If you want to order for a large event, it is better to order up to a week in advance. Can I make an order for the same day? Yes, we can accept orders and send them on the same day. However, we recommend that you place your order at least one day earlier in order to ensure that there are no delays in your reservation. During special holidays such as Valentines or Rosh Hashana, we recommend that you place your orders in advance. Can I add an edible image or writing to my cupcakes? Yes. You can choose to add an “edible print” to cupcakes and also some cakes. 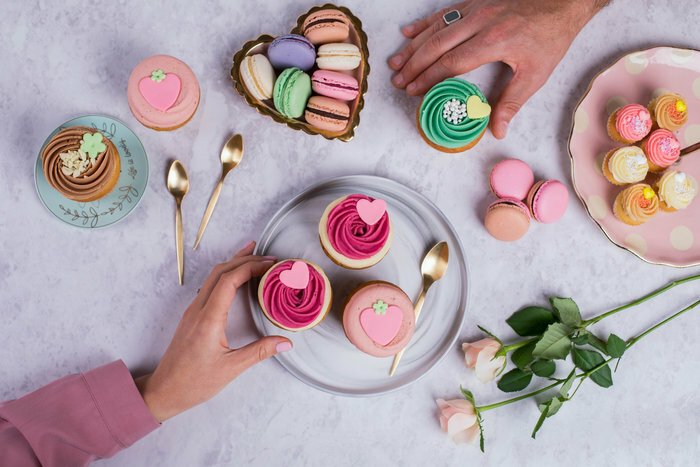 The cupcakes packages that you can add an edible image to are all of the packages that are without a theme, such as “12 medium cupcakes love” for example. Will my order look exactly like the image on the website? All our products are handmade with care. Sometimes the products will be slightly different in design/ colour/ flavour than those that appear on our site, but the theme and look will be maintained. Yes, our bakery is kosher dairy (halavi) and is under the supervision of the Tel Aviv Rabbinate. Do the products contain milk from outside of Israel? Most of our raw materials contain only milk from Israel. Some contain milk from outside of Israel. If this is important to you, you should contact us so we can help you with your order. Do you have vegan or gluten-free products? We have a gluten-free vegan cupcake with banana flavored and chocolate chips and chocolate frosting.. Although this product is made only from gluten free and vegan products, we do not recommend anyone to eat this product that may suffer from allergies. This is because the product is not made in a sterile environment from these allergens, and there may still be traces of gluten and dairy. We deliver to Tel Aviv / Gush Dan area and part of the Sharon area. Our delivery times are from 10:00 am to 20:00 pm and are coordinated within three-hour windows. Delivery coordination is made on the day of delivery with the order recipient. On rainy days, delays can be expected. I’ve changed my mind and I want to cancel my order. Can I get my money back? All of our cupcake cases are custom-made only. If your order is ready, we will not be able to refund payment. Cancellation of an order must be made up to 24 hours from the time set for the delivery or collection from the store. For full cancellation policies, view our terms and conditions. How long is the shelf life of the cupcakes? Cupcakes are best eaten the day on the same day of purchase, however they can be consumed for up to 3 days if kept in the fridge. Do the products contain peanuts / nuts? Not all of our products contain nuts. However, we do not have any separate kitchen for produce to be made in a sterile environment from allergens. We cannot guarantee any of our products to be without nuts and peanuts or other allergens such as soy, gluten, milk and eggs. Should the cupcakes and cakes be kept in the refrigerator? They can be stored in a refrigerator in a closed box. Please remove them from the refrigerator for at least half an hour before eating. Our cupcakes and cakes should be eaten at room temperature. Do your cupcakes and cakes contain eggs? Most of our products do contain eggs. We only have products with cooked eggs, and we do not serve anything with raw eggs. Do the cupcakes and cakes contain artificial food colouring? We add food colors only to vanilla frosting and the red velvet cake. Some cupcake and cake decorations also contain artificial food colouring. Macarons and Cakepops contain artificial food colouring.